CHINA - Electric power company Huaneng has announced it will invest 6 billion yuan ($82 million) to build the world's biggest inter-tidal wind farm in east China's Jiangsu Province. The announcement was made yesterday by Zhao Shiming, general manager of Huaneng New Energy Industry Holding Co, the renewables arm of Huaneng. Zhao said the 300MW Dafeng project would be approved by the central government in the second half of next year. Inter-tidal areas refer to the coastal areas that are submerged in flood tide and bare in ebb tide. The wind farm will cover an area of 127 square kilometers, largely 4-10m in depth, about 55km away from the bank. 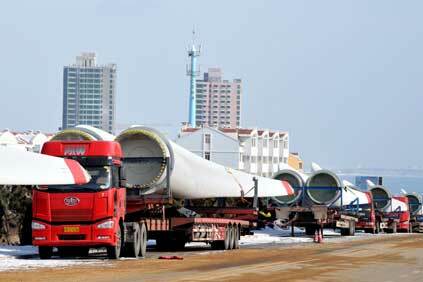 It will consist of 100 units of 3MW wind turbines from Sinovel, the largest wind turbine producer in China. Zhao said the wind farm will produce about 740 million kWh electricity each year, saving 250,000 tonnes coal and reducing emissions of 620,000 tonnes greenhouse gas. So far, wind resource measurement towers have been erected and started to measure wind. The company has also pressed ahead with early-stage works such as geological perambulation and feasibility studies. In May, China officially kicked off preparations for public tenders of offshore wind farms.